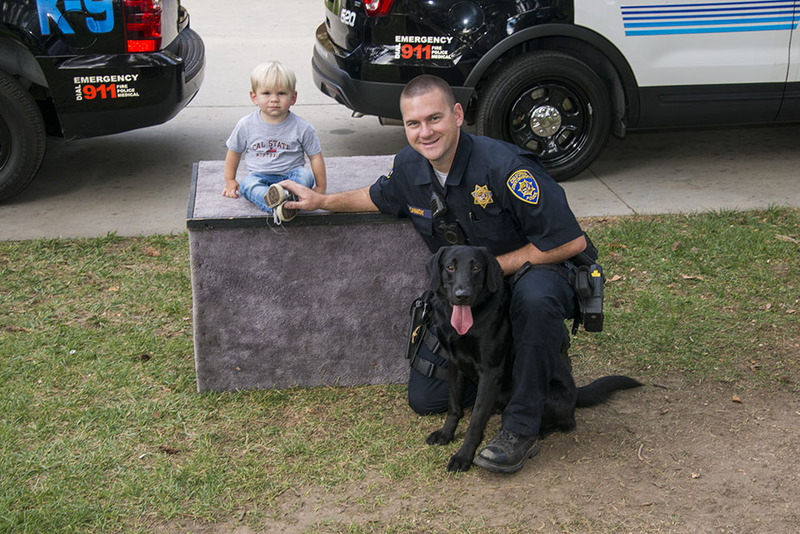 Officer Nick Canady and his partner K9 Tank, a black Labrador retriever. Photo by David J. Hawkins. 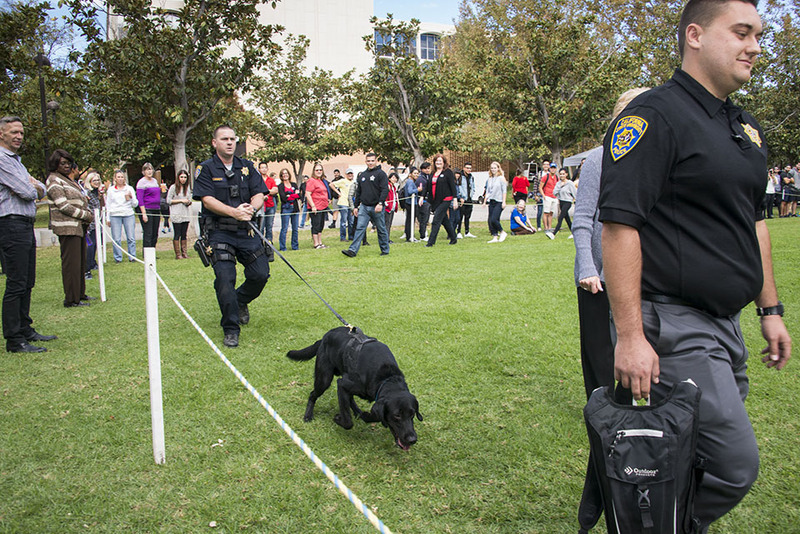 Students pet Labrador Daisy, who is part of CSUN's eighth K9 team, at the "Meet the Dogs" event. Photo by David J. Hawkins. Officer Nick Canady and his partner Tank take a picture with a student. Photo by David J. Hawkins. Officer Virgil Messmore explains the dog's taks. Photo by David J. Hawkins. Community members purchase Daisy- and Tank-themed T-shirts and stuffed animals. Photo by David J. Hawkins. K9 Tank follows a "suspect" carrying explosives. Photo by David J. Hawkins. Officer Nick Canady plays with his partner Tank after the Labrador successfully identified "explosives." Photo by David J. Hawkins. Officer Virgil Messmore and his partner Daisy. Photo by David J. Hawkins. K9 Daisy indicates that she found a suspicious item by sitting down next to it. Photo by David J. Hawkins. Tank’s head turned sharply, and he started to pull heavily at his leash. The 23-month-old black Labrador retriever immediately changed his walking direction and took off after a person carrying a bag. His human partner, Officer Nick Canady, followed Tank, holding the leash tight. “Good boy,” said Canady. 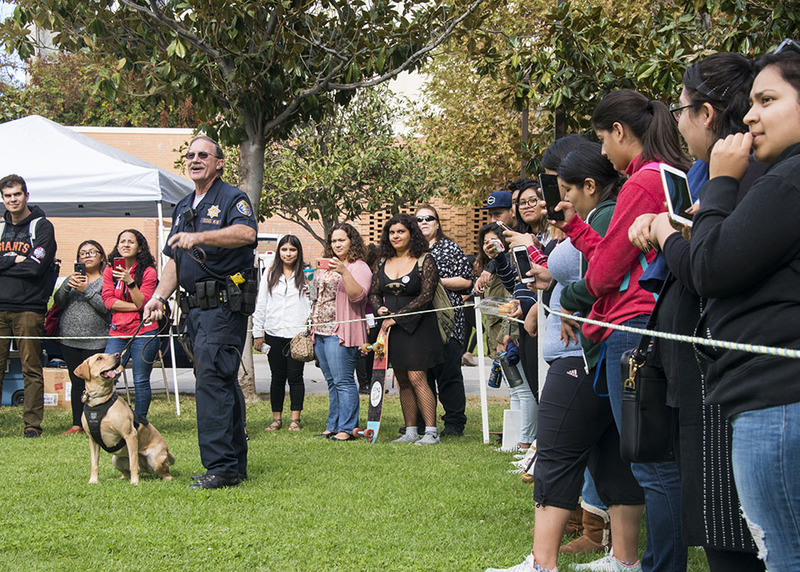 Tank, the newest member of the California State University, Northridge Department of Police Services (DPS), had just identified a mock “suspect” carrying explosives during a demonstration at the campus’ annual Meet the Dogs event, Nov. 7 on Bayramian Lawn. “He recognizes 16 bomb odors,” Canady said. 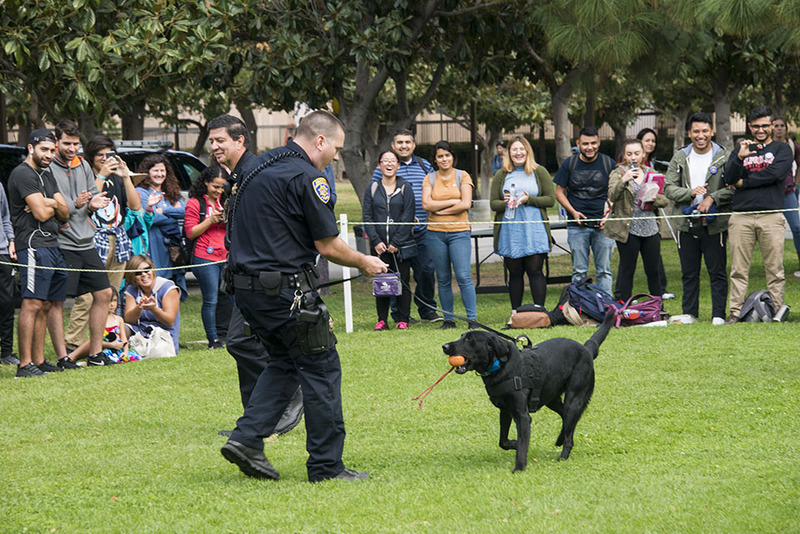 CSUN welcomed its ninth K9 team and second Labrador retriever, Tank — who joined the slightly more veteran Lab, Daisy. 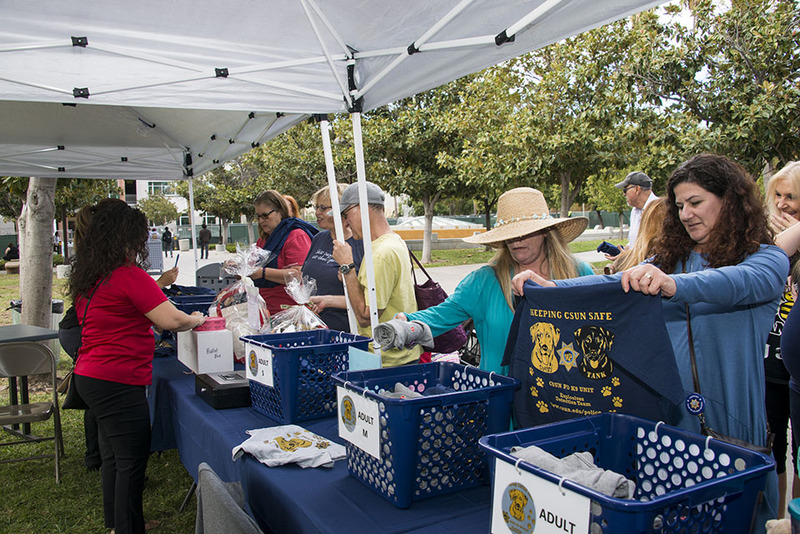 At Meet the Dogs, students, staff and community members could purchase Daisy- and Tank-themed T-shirts and stuffed animals, take pictures with the friendly pups and watch both dogs perform demonstrations. Attendees also received free pins and participated in a gift basket raffle. 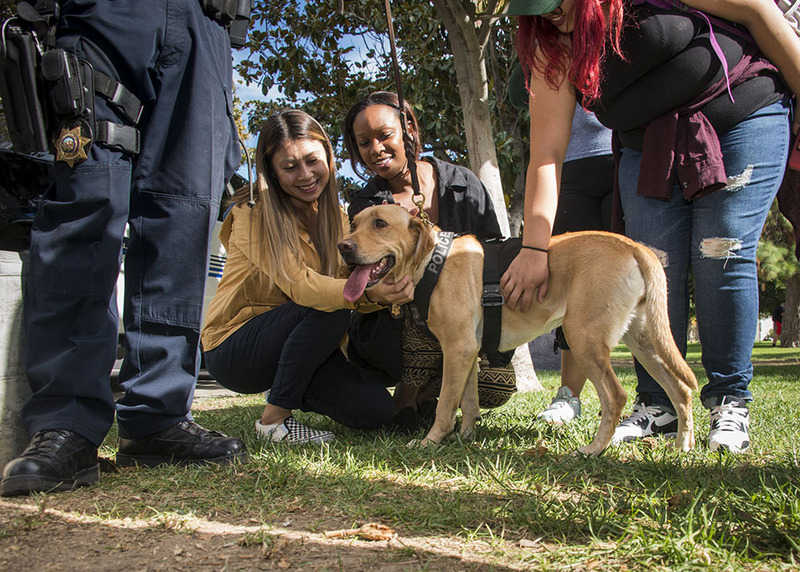 “We come here every year, and we’re excited to see the new dog,” said Seairra Ford, transitional programs assistant at CSUN’s office of Educational Opportunity Programs, who watched the dogs’ performances with liberal studies senior Ashley Cano. “I’m a dog person, I love the puppies,” Cano said. 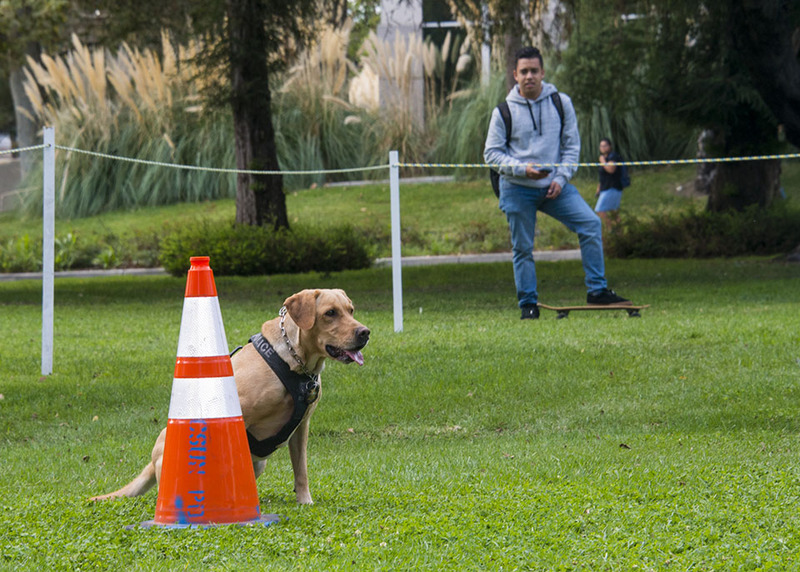 Daisy, a yellow English and American Labrador, also showed off her skills and identified “explosives” hidden below an orange cone. To signal her discovery, she sat down right next to the suspicious item. “She indicates by sitting down, because if she finds a bomb, she is not supposed to touch it,” explained Daisy’s partner, Officer Virgil Messmore. Both K9 dogs generally train every day for about an hour or more during their shifts. Daisy is trained to identify explosives in static places such as parked cars, buildings and outdoor areas. Tank is a “Vapor Wake K9″ trained to smell explosives such as black powder on people moving throughout a large crowd. He is able to sniff out suspicious substances lingering in the air, left by a person who has passed by him. Officer Canady and Tank became a team during the summer. Their first shift together for DPS was Sept. 9. 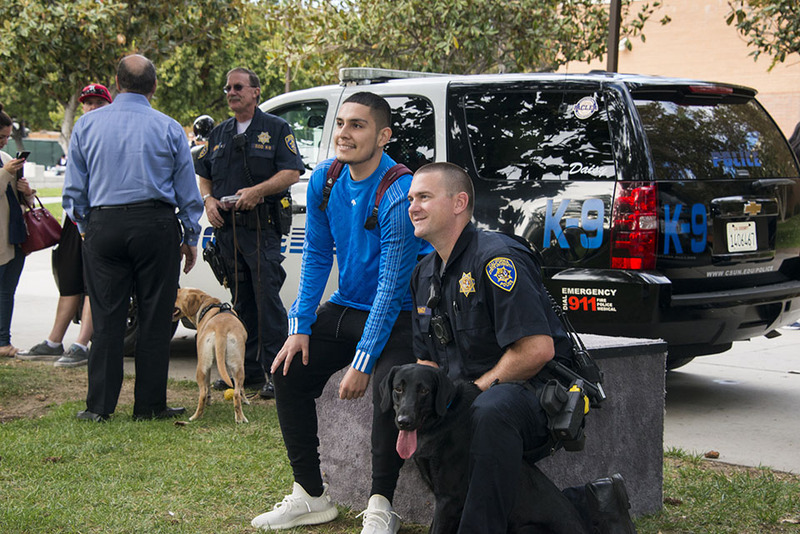 The CSUN K9 unit was launched in 2005. The unit is, in part, supported by the National Police Dog Foundation. 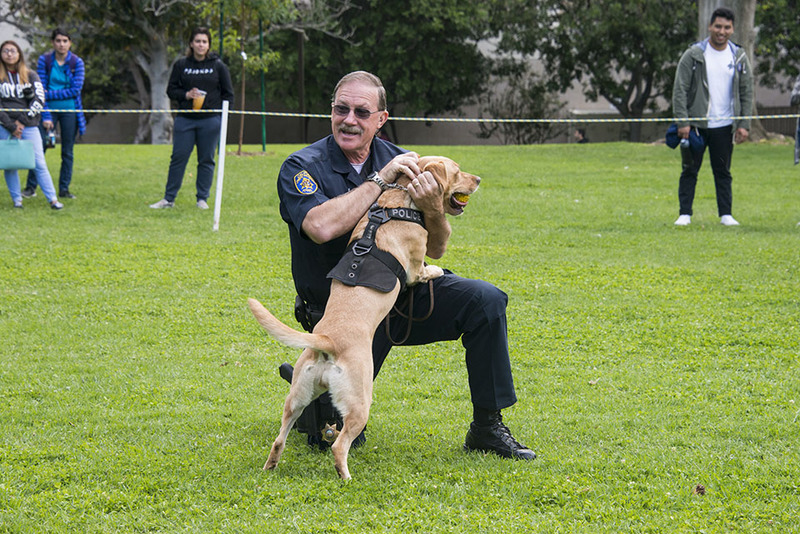 To help support CSUN’s K9 fund, visit the National Police Dog Foundation.